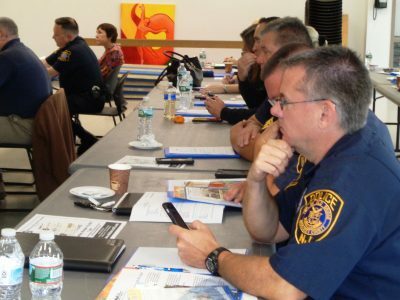 East Brunswick Mayor Brad Cohen welcomed 35 municipal officials and police officers to the Township’s Cultural Center in October to discuss The Rules of the Road, a pedestrian safety seminar sponsored by KMM. 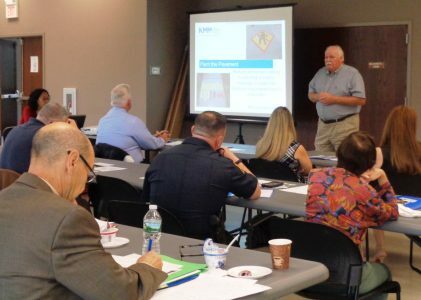 Bill Neary, Executive Director, and others discussed the various motorist and pedestrian safety programs available from KMM. Will Yarzab of the North Jersey Transportation Planning Authority introduced Street Smart. This statewide community-based campaign educates motorists and pedestrians about safe behaviors such as using crosswalks, waiting for the walk signal, obeying speed limits, and stopping for pedestrians. And, everyone must avoid distractions. Communities may enhance Street Smart with KMM’s pedestrian Safety Flags or Paint the Pavement programs. Teenagers are the primary audience for KMM’s Distracted Driving presentation. Videos and interactive exercises emphasize the importance of paying attention when driving. Youngsters can benefit from Safe Routes to School which includes walk and bike to school events, bike rodeos, and classroom activities. Senior citizens will enjoy “The Jay Walker Show” which reminds participants of safe walking tips. Jay Muldoon, Borough Administrator for Metuchen, pulled all of the programs together as he described his experiences with KMM. For more information, please contact Program Coordinator Arlene Holt at aholt@kmm.org or 732-745-4368.